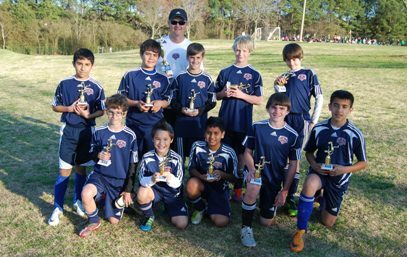 The U12 Boys White team brought home the tournament’s Championship division champion trophy after sweeping all their opponents! The team qualified to Sunday’s semifinal games after winning their Saturday games by scores of 4-0 & 4-1. On Sunday morning’s Semi Final match they had to work really hard to defeat InterAtlanta’s 00 Black team by 1-0 in order to advance to the Final match. And if the semifinal match wasn’t hard enough, the team had an even tougher match in front of them when they faced Roswell’s U12 Inter team. The team worked together extra hard to win the game 5-3 on order to lift up their championship trophies. 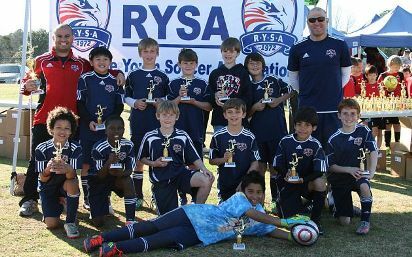 The U12 Boys Navy team brought home the tournament’s top division champion trophies! The team cruised thru Saturday group stage games by winning both games outscoring their opponents 11-2. The team didn’t have much trouble qualifying to the Final match after defeating their semifinal opponents by a score of 4-1. On the Final game, the boys played against a very tough FC Alliance team, but with great performances, they were able to win the game 3-0 and lift the tournament’s champion trophy. Our U11 Girls Academy Red team finished runners-up at their pre-season tournament. The team participated on the tournament's top (Elite) division, where after pulling a win (1-0) and a tie (0-0) on their Saturday games, they qualified to the Semi Final match to be played Sunday morning. After a very competitive match, the team won 2-1 and advanced to the final match against InterAtlanta FC Blue. Our young ladies played a great game that ended up in a tie, so they had to decide the tournament winner with Kicks from the mark. Unfortunately, they were defeated 5-3 on PKs. The U11 Girls White team finished runners-up when participaing in the tournament's White Division. The girls had a very strong showing on their group stage games and won all 3 of them by scores of 4-1, 5-0 & 1-0. On their final match, the girls left everything on the pitch, but unfortunately it wasn’t enough to prevent a 2-0 loss against a very tough opponent like Georgia FC 01 Blue. Great effort ladies! 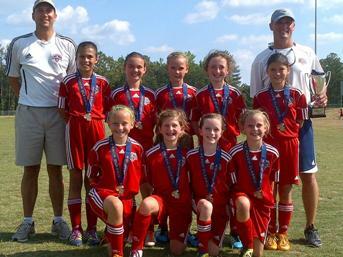 The U11 Girls Red team finished their season on a really high note by winning their post-season tourney. The team cruised to the final match after 3 straight wins by the scores of 2-1, 5-4 & 4-0. On their final game, they faced a very strong Triumph team, but the girls played very hard and edged their opponent 1-0 and bring home a very much deserved champions trophy! 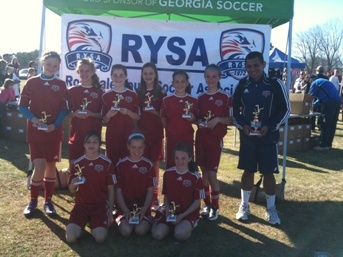 U10 Girls Red team wins the Atlanta Peach Classic Championship! 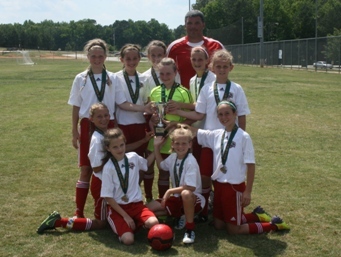 Congratulations to the U10 Girls Red team for being crowned Champions in the Atlanta Peach Classic Tournament! The girls displayed outstanding sportsmanship, teamwork and skill in each of their matches. Their level of play continued to build through the weekend with three bracket wins of 2-1, 4-1, 4-3. They went on to face a very talented Top Hat team in the finals Sunday and played an outstanding match with a 4-2 win! Way to go ladies and congratulations on a great season! 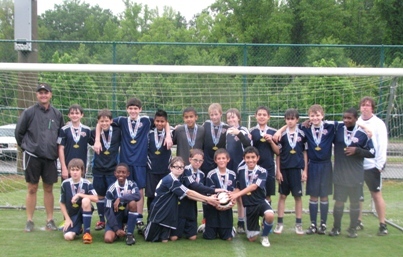 Macon United Navy U12 Boys team won the 11v11 Dempsey Division Championship at the 2012 Academy Cup !!! They started off slow with a 1-1 tie against Inter Atlanta White. They came out strong in the second match of the day against Savannah Celtic Green winning 3-1. Sunday morning brought the toughest challenge as they defeated a very tough Dacula White team in the driving rain!! Macon United advanced to the final 4-2. The rain kept coming so the championship match against Columbus Red Star was played out in PKs only due to field conditions. 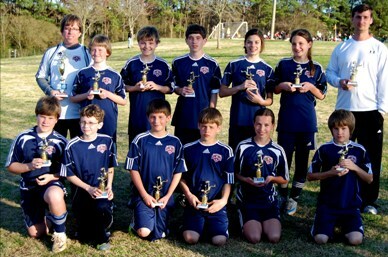 Macon defeated CFC Red Star 5-4. 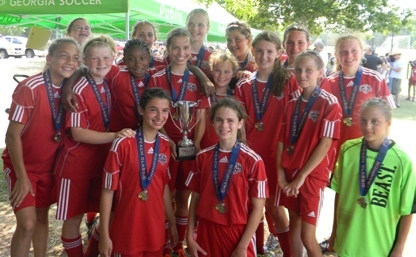 The Macon United U12 Girls won the Gold Division at the Atlanta Peach Classic. Playing 11 v 11 at a tournament for the first time, the girls only allowed three goals during their first three games to advance to the finals. In the championship game the Macon United U12 Girls traded goals with a strong SSA team and it looked like the game would end in a 1-1 tie. 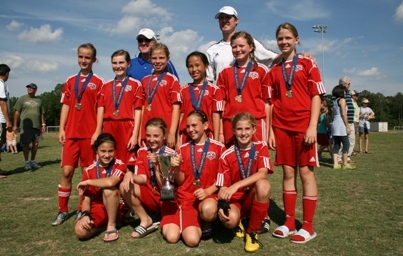 However, with less than a minute to play the Macon United U12 Girls pressed hard to avoid overtime and managed to score a breakaway goal that sealed a 2-1 victory and allowed them to bring home their third championship trophy over the course of the 2011-2012 season.